Like most common names, "Red Quill Spinner" can refer to more than one taxon. They're previewed below, along with 15 specimens. For more detail click through to the scientific names. These are often called Red Quill Spinners. The Hendrickson hatch is almost synonymous with fly fishing in America. It has been romanticized by our finest writers, enshrined on an untouchable pedestal next to Theodore Gordon, bamboo, and the Beaverkill. The fame is well-deserved. Ephemerella subvaria is a prolific species which drives trout to gorge themselves. Its subtleties demand the best of us as anglers, and meeting the challenge pays off handsomely in bent graphite and screaming reels. Ours may be the sport of gentlemen, but the gentleman may drool a little on his tie when he thinks of this hatch-to-come after a dismal fishless winter. Ephemerella subvaria (Hendrickson) Mayfly Nymph View 4 PicturesI've never seen this strange coloration on any Ephemerella subvaria nymph in a book before, but it's similar to several other specimens I collected on the same outing, including a smaller one that I photographed. They were outnumbered by the "normal" Ephemerella subvaria nymphs in the sample. 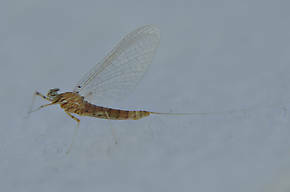 Male Ephemerella subvaria (Hendrickson) Mayfly Dun View 9 PicturesI collected this male Hendrickson dun and a female in the pool on the Beaverkill where the popular Hendrickson pattern was first created. He is descended from mayfly royalty. Male Ephemerella subvaria (Hendrickson) Mayfly Spinner View 11 PicturesI collected this beautiful male Hendrickson specimen as a dun, along with a female Hendrickson from the same hatch. Both molted into spinners in my house within a couple of days. These are sometimes called Red Quill Spinners. This species, the primary "Sulphur" hatch, stirs many feelings in the angler. There is nostalgia for days when everything clicked and large, selective trout were brought to hand. There is the bewildering memory of towering clouds of spinners which promise great fishing and then vanish back into the aspens as night falls. There is frustration from the maddening selectivity with which trout approach the emerging duns--a vexing challenge that, for some of us, is the source of our excitement when Sulphur time rolls around. Ephemerella invaria is one of the two species frequently known as Sulphurs (the other is Ephemerella dorothea). There used to be a third, Ephemerella rotunda, but entomologists recently discovered that invaria and rotunda are a single species with an incredible range of individual variation. This variation and the similarity to the also variable dorothea make telling them apart exceptionally tricky. 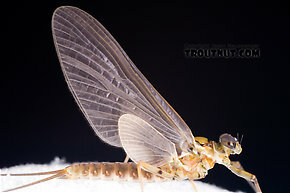 As the combination of two already prolific species, this has become the most abundant of all mayfly species in Eastern and Midwestern trout streams. Ephemerella invaria (Sulphur Dun) Mayfly Nymph View 8 PicturesThis small Ephemerella invaria nymph was at least a month away from emergence. This is the first really good dry-fly opportunity of the season for most Eastern anglers. 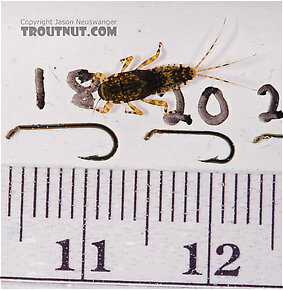 They are large mayflies and they have good points of vulnerability both underwater and on the surface. 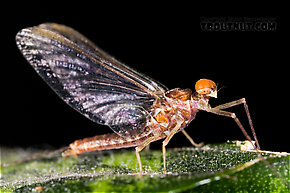 The wing pads on this final instar Baetidae mayfly nymph are extremely dark. 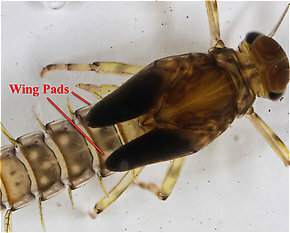 Wing pad: A protrusion from the thorax of an insect nymph which holds the developing wings. Black wing pads usually indicate that the nymph is nearly ready to emerge into an adult.). I believe it had not been dead long enough to lose its natural coloration. Male Epeorus pleuralis (Quill Gordon) Mayfly Dun View 9 PicturesI kept this specimen after photographing it and it molted into a spinner in perfect condition, which I photographed here. Male Epeorus pleuralis (Quill Gordon) Mayfly Spinner View 10 PicturesI spent (Spent: The wing position of many aquatic insects when they fall on the water after mating. The wings of both sides lay flat on the water. The word may be used to describe insects with their wings in that position, as well as the position itself.) most of the day looking for Epeorus pluralis duns or spinners without any luck on the major Catskill rivers. Finally in the evening I arrived at a small stream somebody had recommended, and when I got out of the car I was happy to find that I had parked in the middle of a cloud of male spinners. These are very rarely called Red Quill Spinners. Epeorus longimanus and Epeorus albertae are the two most common Epeorus species in the West. 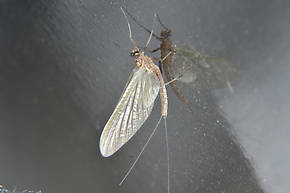 Female Epeorus longimanus (Slate Brown Dun) Mayfly Spinner View 1 PicturesI associated this female with a male I collected one night later. 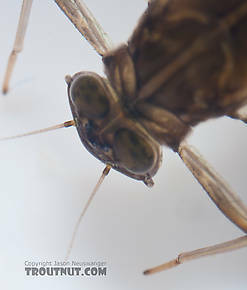 For a great and informative discussion of all Epeorus species and other mayflies be sure and read, WESTERN MAYFLY HATCHES by R. Hafele and D. Hughes. They rate all of the western mayflies and they rate the hatch of this genus a 25 out of a possible 45 points based on several rating criterion. They provide insect photos, possible fly patterns and fly presentations. This is a great book. 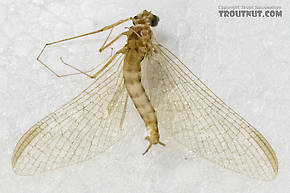 This can be the first mayfly of the season on high mountain streams in the western states, but emerges later in the season in Alaska. It is the most important species of Cinygmula for anglers. Cinygmula ramaleyi (Small Western Gordon Quill) Mayfly Nymph View 9 PicturesThis nymph is almost definitely the same species as this dun, which hatched from a nearly identical nymph from the same collection. Female Cinygmula ramaleyi (Small Western Gordon Quill) Mayfly Dun View 7 PicturesThis dun is almost certainly of the same species as this nymph, as it hatched in my cooler from a nearly identical nymph. Male Cinygmula ramaleyi (Small Western Gordon Quill) Mayfly Spinner View 4 PicturesThis one was preserved in ethanol and partially dissected, so it doesn't have its natural wild coloration, and it's missing some appendages. I'm posting it for identification purposes. Male Cinygmula ramaleyi (Small Western Gordon Quill) Mayfly Adult View 4 PicturesAdults were collected from the North Fork of the Touchet River at Touchet Corral, 21 Sept. One photo is the swarm of males over the stream about 3 PM, air temp about 66 degree. This is one of the two most common species of Rhithrogena. 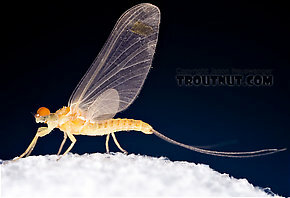 Dun: Mayflies have two adult stages. They first emerge from the water as duns (scientifically known as the subimago stage). They then molt into the spinner (imago) stage, in which they mate and die. Sometimes the word "dun" is confusingly used to refer to a brownish gray color in fly tying materials. Emergence: The transformation of a nymph or pupa into the adult winged stage of an insect. The term may refer to the emergence of an individual, or the daily or yearly event in which all individuals of a species emerge. Natural: A natural is a real insect (or similar creature) a trout might eat. The term is used to specify the real thing as opposed to its artificial imitation. 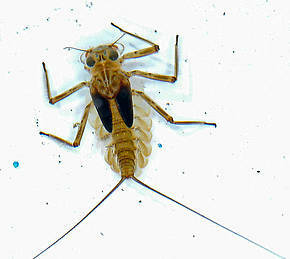 Nymph: The juvenile, underwater stages of mayflies, stoneflies, dragonflies, and damselflies and other aquatic insects whose juvenile stages are covered by hard exoskeletons. The word can also refer to the fishing flies which imitate these creatures, in which case it is used as a blanket term for flies imitating any underwater stage of an invertebrate (except for crayfish and leeches). 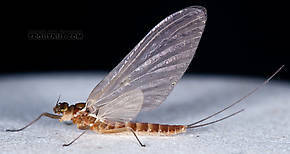 Spent: The wing position of many aquatic insects when they fall on the water after mating. The wings of both sides lay flat on the water. The word may be used to describe insects with their wings in that position, as well as the position itself. 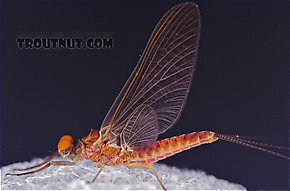 Spinner: There are two winged stages of adult mayflies. 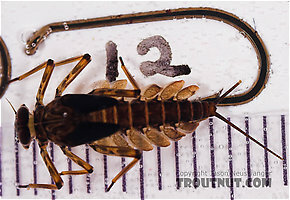 They emerge from the water as duns, molt on land (usually) into their fully mature stage, spinners. As spinners, they mate, lay eggs, and die. 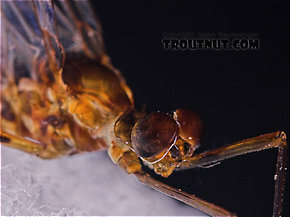 Wing pads: A protrusion from the thorax of an insect nymph which holds the developing wings. Black wing pads usually indicate that the nymph is nearly ready to emerge into an adult.